The Tie Xi district in Shenyang in northeast China was established during the Japanese occupation and transformed into a highly populated industrial area. This unusually long-form documentary, taking us on a tour of this now decaying area, spreads over nine hours and three parts entitled Rust, Remnants, and Rails. Factories and towns become ruins, people are buffeted by change, and time ebbs away. An extraordinary documentary that puts the realities facing Chinese society into stark relief, through an exclusive and extended exploration of the region. [Directors Statement] Tie Xi Qu: West of Tracks is an independent documentary in three parts, titled: Rust, Remnants, and Rails. Part I, Rust, explores the legacy of fifty years of Chinese central economic planning and the ways in which Chinese individuals, families and society have been shaped by decades of living under the socialist economic system. The film focuses on the daily lives and work routines of Chinese workers in three different financially troubled state-owned factories within the Tie Xi district of northeastern China. As the factories slide closer and closer to bankruptcy, massive layoffs force workers out of their predictable, familiar factory environments and into an uncertain and frightening future. Part II, Remnants, focuses on the lives of a group of teens living with their parents in factory-provided housing in a blue collar neighborhood in the Tie Xi district—an area known as “Rainbow Row,” which has been slated for destruction by local authorities. Filmed between 1999 and 2001, Remnants documents the everyday lives of these residents as they deal with the impending demolition of their neighborhood, and examines the mores and values, hopes and dreams, struggles and aspirations of the Chinese working class. 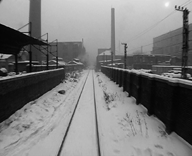 Part III, Rails, tells the story of the old freight railway that links the factories of the Tie Xi district together, and of two men: Du Xiyun and his son, unemployed scavengers living at the fringes of society, who depend upon the railway for their livelihood. As Du Xiyun and his son struggle to cope with changes in the world around them and to maintain some control over their own destinies, their friends working for the state-owned railways continue going through the empty motions of their jobs, absurdly, as if frozen in an era long since past. Born in 1967 in Shaanxi province. Received B.A. in photography from the Luxun Arts University of Shenyang in 1992. Entered the Beijing Film Academy cinematography department in 1995. Began working as an independent filmmaker and director in 1998. In 1999 worked as a cameraman for the independent feature film Distortion, and directed his first documentary, Tie Xi Qu. Shooting lasted until the end of 2001. Tie Xi Qu (300-minute version) was selected at the 2002 International Forum of the Berlin International Film Festival. Awarded prize for Best International Documentary at the Lisbon International Documentary Festival, and this version won the Grand Prix at the 2003 International Documentary Festival, Marseille.